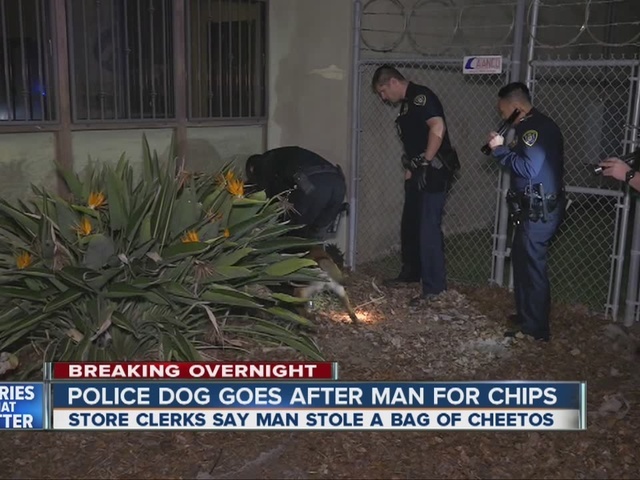 SAN DIEGO -- A man who allegedly stole a bag of Cheetos from a gas station was taken into custody about a block away when police and K9s caught up to him. It all started around 1:45 a.m. Tuesday inside an ampm store in the 1800 block of Euclid Avenue. The store's employees said the suspect tried to steal a bag of Cheetos and when confronted, punched one of the workers and wrestled with another before running away. The suspect left behind the bag of chips, his shoes and jacket. San Diego police officers, with the help of a helicopter and K9s, quickly caught up to the suspect and took him in to custody. The store's clerks said they had seen the man in the store before, but he had never caused any problems. The suspect's name, along with any charges he is facing, has not yet been released by police.